Being one of the most unique and extra KPOP idols, G-Dragon always manages to surprise us with his unique style and interesting artistic vision. Just as the song says G-Dragon and his videos are definitely "One of a Kind." 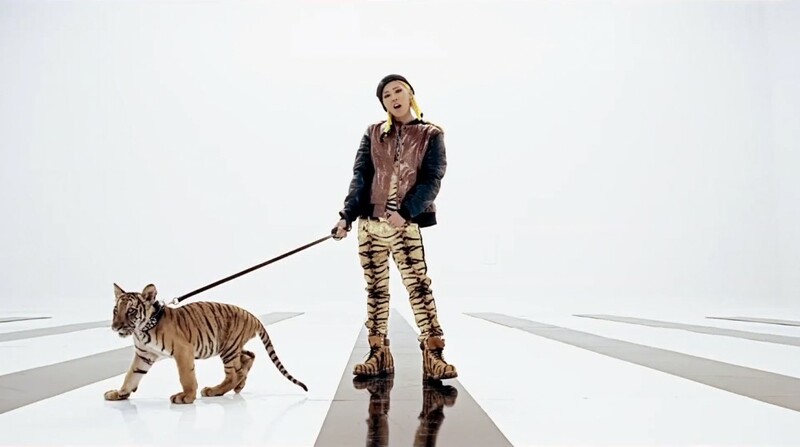 T.O.P loves his animals. He's known to be one of KPOP industry's rap gods and his vision and style are quirky. He's goofy but he looks like a boss as he sits elegantly with a deer by his side. The beautiful queen, HyunA, is known for her beauty, seductiveness, and her talents. "Red" features her gently holding a monkey looking over her shoulder. The Nation's Little Sister gained much fame from this video that showcases her wonderful vocal range and cute personality. And it all starts with her walking into a store with her little parrot friend. The music video features a darker mysterious image for BEAST. Nothing adds more drama and aesthetic than a hawk perching powerfully on Kikwang's arm. Plus his red hair adds a beautiful contrast to the greyscale look of the set. Kyung is an incredibly talented rapper and when he gets bombarded by his bandmates to hide a package, he is obviously shocked when all he wanted was to catch a rooster. With its catchy tunes, bright colors, and fun dance, "H.E.R" is a song that all BBC fans love. Why there's an ostrich no one can explain but it does add character to one of Block B's most famous songs. With beauty comes grace and a dove is the most accurate representation for both. Girls' Generation embodies the concept of beauty and grace, so no better animal to take part in their music videos than a delicate dove. Serpents represent truth, wisdom, seductiveness, and power. All these elements come together represented by 4minute with their powerful and seductive video .